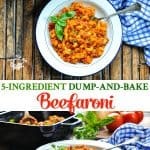 This homemade Dump-and-Bake Beefaroni recipe only requires about 5 minutes of prep! 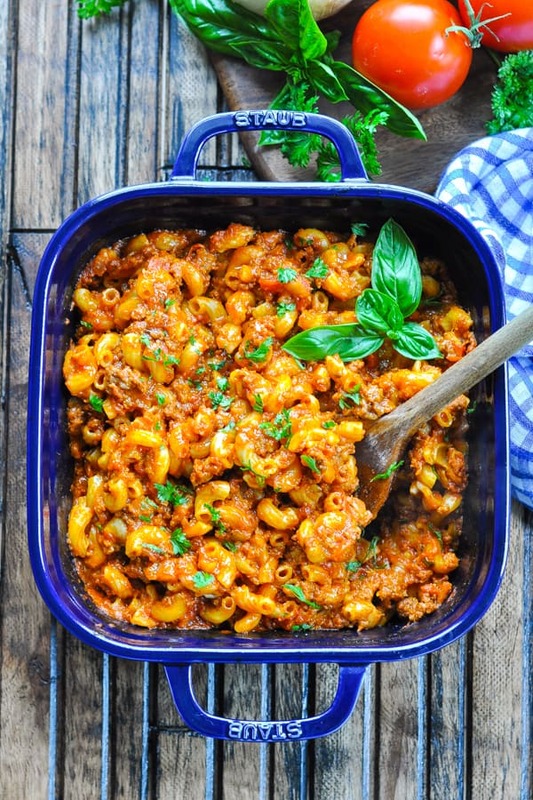 This healthy, homemade Dump-and-Bake Beefaroni recipe is a 5-ingredient easy dinner that only requires about 5 minutes of prep! You don’t even have to brown the meat or boil the pasta before it all cooks in one dish! Ditch the canned stuff, because this simple version is WAY better, way healthier…and it’s almost as fast to pull together! 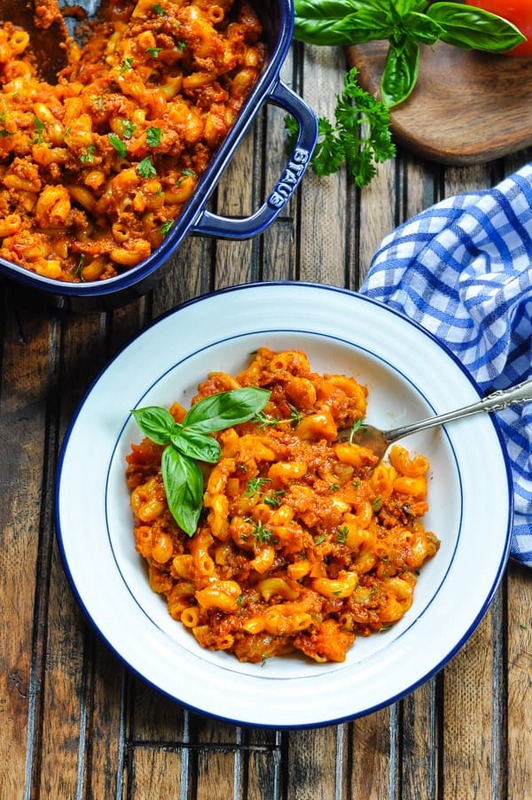 The store-bought Chef Boyardee Beefaroni is described as “pasta in tomato and meat sauce,” and that’s exactly what we’ve got here. It’s a kid-friendly dinner for your busiest weeknights, and it only requires a few minutes of your attention before you pop it in the oven. 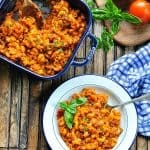 HOW DO YOU MAKE BEEFARONI CASSEROLE? 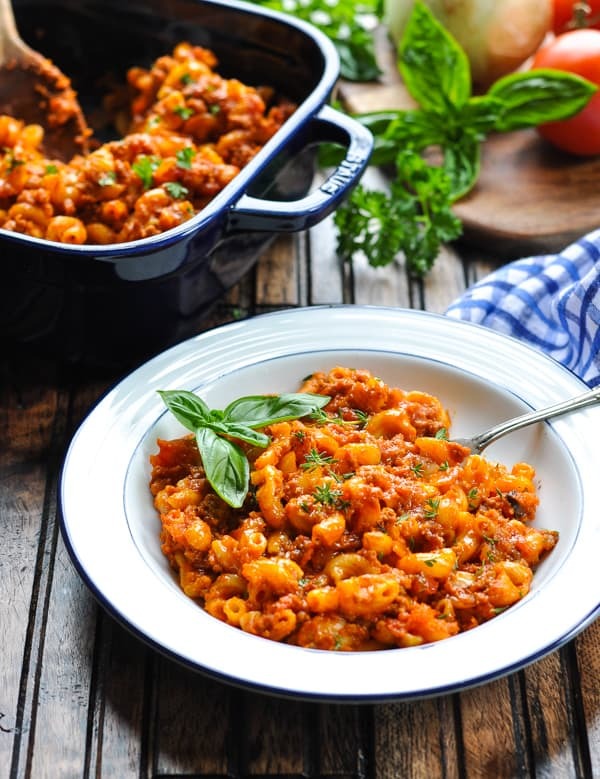 This homemade beefaroni casserole requires just 5 simple ingredients that you probably already have in your kitchen: a jar of pasta sauce, elbow macaroni pasta, extra lean ground beef, diced onion (I use frozen for a shortcut) and cheddar cheese. You’ll also need a little bit of water when stirring everything together. I prefer to grate my own cheese for this casserole, because hand-grated cheese seems to melt better than a bag of the pre-shredded stuff. Either will work, so use whatever you’ve got on hand, but block cheddar is definitely best! Once you’ve got all of your ingredients out on the counter, you literally dump everything into a casserole dish, stir, and cover with foil. How easy is that?! You’ll stir the casserole about halfway through the baking time, just to make sure that everything cooks evenly. After about 45 minutes in the oven at 425 degrees F, you will have a delicious and hearty homemade Beefaroni to share with your family — no cans required! The pasta absorbs a lot of the liquid as it cooks, so the sauce will be thick, rich, and cheesy. What more could a hungry child (or parent) ask for on a chilly night?! Do NOT boil the pasta or brown the beef before it goes into the dish. All of your ingredients are raw! Grate your own cheddar — it melts better than the packaged version. Make sure to spray the baking dish before adding your ingredients. This will prevent the pasta from sticking as it bakes. Stir the pasta halfway through the baking time. This will ensure that all of the ingredients cook evenly. I recommend using extra lean ground beef (at least 93% lean). This is because you will not be draining the meat after it cooks, so you don’t want extra grease in your casserole. If you prefer, you can substitute ground turkey breast or ground chicken breast for the ground beef. Serve the Beefaroni with optional toppings such as fresh parsley or basil, or extra grated cheddar or Parmesan cheeses. This recipe makes enough to serve about 3-4 people. If you’re cooking for a larger family, I suggest that you double all of the ingredients and bake the casserole in a 9 x 13-inch dish. The rest of the cooking instructions remain the same. Spray a 2-quart (about 8-inch square) baking dish with cooking spray. 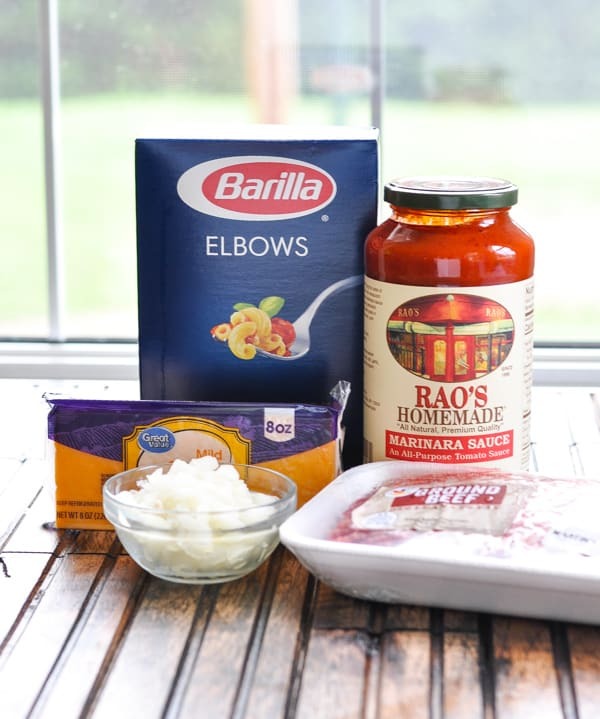 Place onion, uncooked pasta, grated cheese, marinara sauce, and water in the dish and stir to combine. Add the uncooked ground beef to the dish, breaking it up into small pieces with your fingers. Stir to combine. Cover tightly with foil and bake for 25 minutes. Stir, cover, and return to oven for 15-20 more minutes, or until pasta is tender and beef is cooked through. 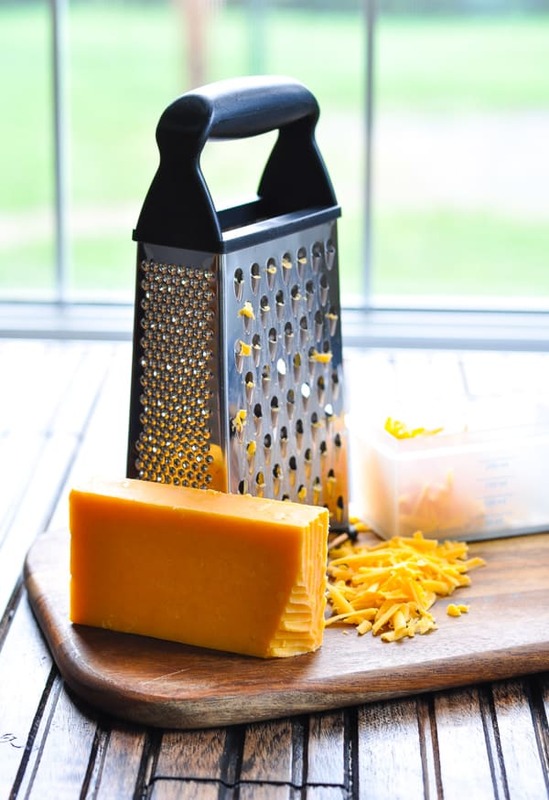 Grate your own cheddar -- it melts better than the packaged version. I recommend using extra lean ground beef (at least 93% lean). This is because you will not be draining the meat after it cooks, so you don't want extra grease in your casserole. If you prefer, you can substitute ground turkey breast or ground chicken breast for the ground beef. This recipe makes enough to serve about 3-4 people. If you're cooking for a larger family, I suggest that you double all of the ingredients and bake the casserole in a 9 x 13-inch dish. The rest of the cooking instructions remain the same. This was a common meal in all homes in Rhode Island in the 1950-60’s. But it was called American Chop Suey. We did boil the pasta first and brown the ground beef first. My mother used a can of plain tomato sauce but she and my aunt always said you give it a couple good glops of ketchup. This is how I’ve made it for my family. And still do. 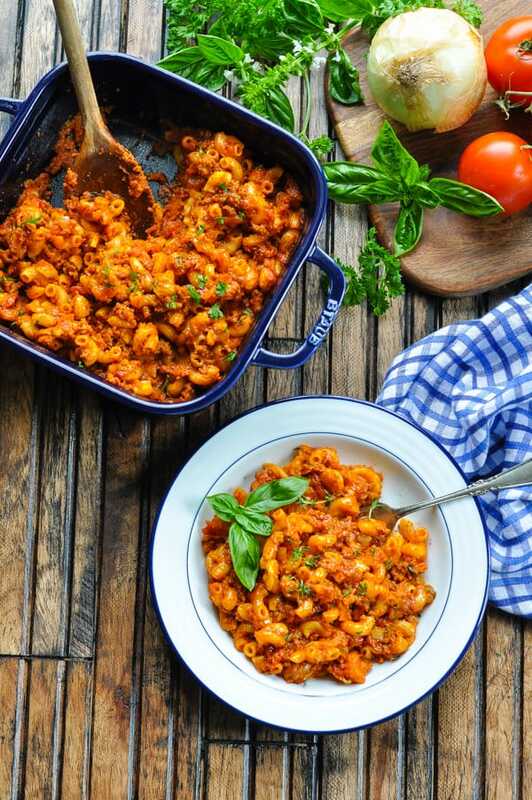 Even though the macaroni is uncooked in this dish, I’d like to pass along the best tip for baked pasta dishes I’ve ever used (courtesy of Sara Moulton). Don’t boil the pasta! Soak any sized pasta in a large bowl of warm salted water for up to 45 minutes & the baked pasta won’t be mushy or overcooked. So there is no need to turn on a burner & heat up the kitchen. Use the soaking bowl for mixing the ingredients & there’s no boiling pot to wash. This method has never failed me. Have you frozen this Blair? It sounds like a great candidate for a freezer meal, but I always worry about freezing pasta (the ‘mush’ factor). I also like the hint Sam shared about soaking the pasta! Hi! I haven’t tried freezing it, but I bet it would work! The pasta might be a little bit more mushy than normal, but I think it would still be okay! 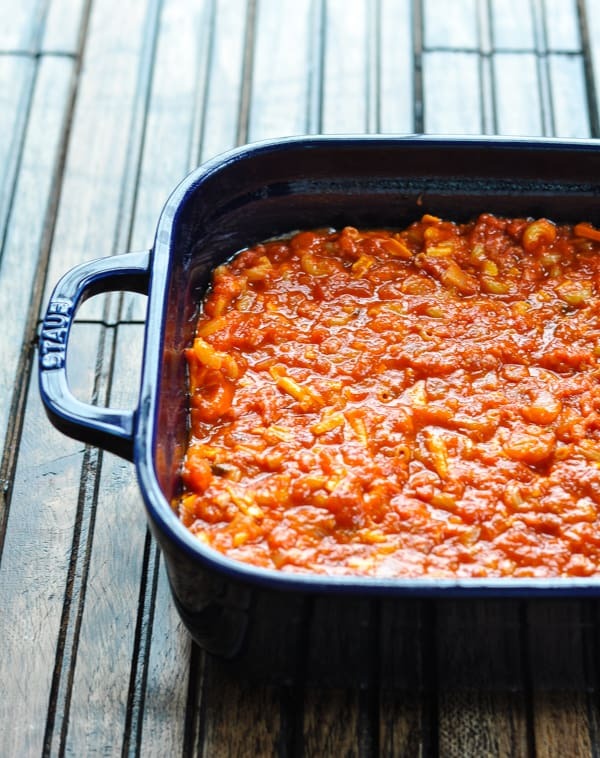 I agree that it’s a great way to prepare a pasta casserole! What are your thoughts of adding a chili block to this recipe ? 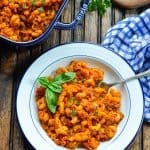 Do you have a hamburger chili Mac and cheese recipe ? My husband loves these types of recipes and I can’t wait to give this one a try.